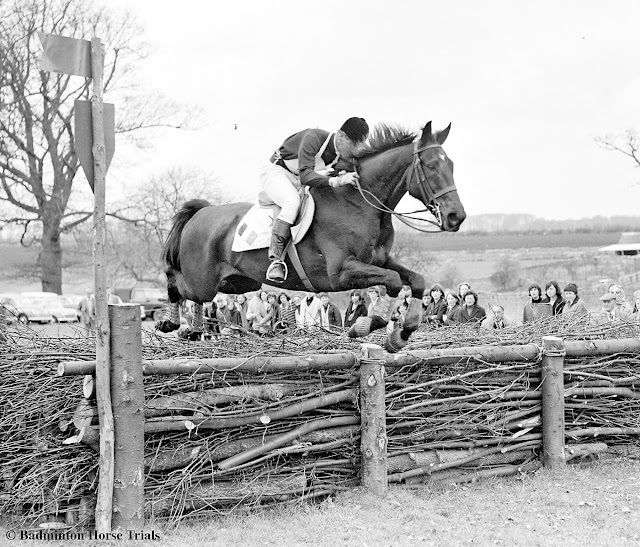 A bit of Badminton History first -- gleaned from various sources: The first Badminton Horse Trials was held in 1949 by the Duke of Beaufort to let British riders train for High Performance competition. It was billed as "the most important horse event in Britain." Only the second three-day event held in Britain (the first being the 1948 Olympics), the first Badminton had only 22 horses to start -- from Britain and Ireland -- and was won by Golden Willow with eight of the 22 not finishing. Badminton moved to Windor Castle in 1955 at the invitation of the Queen of England, where the 2nd European Championship was held. In 1989 Hugh Thomas took over for Frank Weldon as course designer. The course is held in a six square kilometer (1500 acres) area of Badminton Park. Mitsubishi Motors took over sponsorship from Whitbread, in 1992 and renewed their deal this year. The cross country day at Badminton attracts crowds of up to a quarter of a million, which are the largest for any paid-entry sport event in the United Kingdom, and the second largest in the world (after the USA's Indianapolis 500.